Dorial Green-Beckham (born April 12, 1993) is an American football wide receiver for the Philadelphia Eagles of the National Football League (NFL). He was drafted by the Tennessee Titans in the second round of the 2015 NFL Draft. He played college football at Missouri until he was dismissed in 2014. A two-time USA Today High School All-American (2010 and 2011) at Hillcrest High School in Springfield, Missouri, Green-Beckham was the first wide receiver to be named USA Today Offensive Player of the Year since Andre Hastings in 1989. He was also the first wide receiver to ever win the Hall Trophy, awarded to the nation's best high school player. A native of Springfield, Missouri, Green-Beckham attended Hillcrest High School, where he was a three-sport star in football, basketball and track. In 2008, his freshman year, Green-Beckham caught 37 passes for 801 yards and 13 touchdowns. As a sophomore, he posted 66 catches for 1,616 yards and 23 touchdowns. As a junior in 2010, Green-Beckham was the Rivals High School Football Junior of the Year after he had 78 receptions for 1,706 yards with 15 touchdowns. As a senior, Green-Beckham had 119 receptions for 2,233 yards with 24 touchdowns. In October, he became the nation's all time leading high school receiving yards leader, a record broken on November 16, 2013, by Trey Quinn, a Lake Charles, Louisiana, receiver from Barbe High School. For his play he was named the Sporting News High School Athlete of the Year. He played in the 2012 U.S. Army All-American Bowl. Also a talented track & field athlete, Green-Beckham was named the 2009-10 Gatorade Missouri Boys Track & Field Athlete of the Year. As a sophomore in 2010, Green-Beckham captured the Missouri Class 4 State Track titles in the 100 meters and triple jump, and also took second in the long jump. He ran a career-best time of 10.59 seconds in the 100-meter dash at the 2010 Class 4 Sectional 3. He also had personal-bests of 7.11 meters (23-2.25) in the long jump and 14.45 meters (47-3.75) in the triple jump. One of the most highly regarded football recruits of the class of 2012, Green-Beckham was listed as the number one overall prospect in the nation by Rivals.com. He is considered the third best by Scout.com, ESPN and Sporting News. In January 2012 he narrowed his college decision to Alabama, Arkansas, Missouri, Oklahoma and Texas, and he stated that he would make his decision on National Signing Day (February 1, 2012). In a nationally televised ceremony, Green-Beckham announced he would sign a national letter of intent to attend the University of Missouri. Said Green-Beckham of his decision, "just to stay home and have all those guys [family, friends] come out and see me [was big]". He picked Missouri over SEC-rival Arkansas, also because offensive coordinator Garrick McGee, who had formed a strong relationship with Green-Beckham and his family, left the school in December 2011. Receiving playing time as a true freshman, Green-Beckham played the "X" receiver position in Missouri's offense, the same one prolific pass-catchers like Michael Egnew and Danario Alexander have thrived in, in previous seasons. He appeared in the first five games of the season, registering five catches for 125 yards, including an 80-yard touchdown reception against Central Florida. Then came an arrest and suspension due to drug possession, causing Green-Beckham to miss the Vanderbilt and Alabama game on October 6 and 13, respectively. Green-Beckham returned for the second half of the season on October 27 against Kentucky, catching a season-high seven throws for 25 yards. In a 7–14 loss at Florida, he totalled six catches for 75 yards. Then, in a four-overtime 51–48 win over Tennessee, Green-Beckham had two catches, both for touchdowns, and for 35 yards. In the final minute of regulation, he caught a game-tying touchdown in the left corner of the end zone. Against Syracuse and Texas A&M, he added two and four catches, for 79 and 55 yards, respectively. For his freshman season, he had 28 receptions for 395 yards and a team-best 5 receiving touchdowns, which earned him honorable mention freshman all-American honors by College Football News. In his sophomore season, Green-Beckham had 59 receptions with a 15-yard average and 12 touchdowns. In the SEC championship game against Auburn, he caught six passes for 144 yards and two scores. His 27-yard catch set up Henry Josey's go-ahead score in the Cotton Bowl victory over Oklahoma State. Green-Beckham was dismissed from the University of Missouri football team on April 11, 2014 (see below). He then transferred to the University of Oklahoma. He sat out the 2014 season as a transfer restriction, after a waiver request was denied by the NCAA. In January 2015, Green-Beckham announced he would be entering the 2015 NFL Draft. During his time at Oklahoma, he spent his season on the scout team and didn't play a single down for the Sooners before declaring for the draft. Green-Beckham was selected with the 40th overall pick in the second round of the 2015 NFL Draft by the Tennessee Titans. On June 1, 2015, the Titans signed Green-Beckham to a 4-year, $5.6 million contract with $3.0 million guaranteed and a $2.3 million signing bonus. He made his first appearance with the Titans during the 2015 season opener against the Tampa Bay Buccaneers. The next game he made his first career catch on a 13-yard touchdown pass from Marcus Mariota in a 28-14 loss at the Cleveland Browns. On September 27, 2015, Green-Beckham became the third player in the Titan's history to score touchdowns on his first two NFL receptions. On October 25, 2015, he made his first career start in a 10-7 loss to the Atlanta Falcons. He made his second career start during a Week 9 matchup at the New Orleans Saints, filling in for an injured Kendall Wright and made 5 catches for 77-yards. During a Week 13 contest against the Jacksonville Jaguars, Green-Beckham made 5 receptions for a season-high 119 receiving yards, including a 47-yard touchdown reception in the fourth quarter. On December 20, 2015, he caught a season-high 6 passes for 113-yards in a 33-16 loss to the New England Patriots. On August 16, 2016, Green-Beckham was traded to Philadelphia Eagles in exchange for offensive lineman Dennis Kelly. Green-Beckham was born as the third of six children born to Charmelle Green, a single mother, in St. Louis, Missouri. He never knew his biological father and lived in several foster homes before John Beckham, his high school coach, and his wife Tracy officially adopted him on December 30, 2009. The Beckhams had brought Green and his younger brother Darnell into their home in 2006. The couple has one other child, a young daughter, whom Dorial is very close to. Darnell Green-Beckham is currently receiving treatment for acute lymphoblastic leukemia but is in remission. Darnell also signed a letter of intent to play for Missouri, but has decided to pursue a career in modeling instead. On October 3, 2012, Green-Beckham and two other freshman teammates, linebacker Torey Boozer and receiver Levi Copelin, were arrested on marijuana charges by the University of Missouri police department after the three were found in possession of 35 grams (1.2 oz) or less of marijuana.They were suspended from the next game, October 6 against Vanderbilt.The case was resolved on October 16, 2012 when Green-Beckham entered a guilty plea to a reduced charge of trespassing in Columbia, Missouri Municipal Court. He was fined $200 plus court costs. On January 10, 2014, Green-Beckham was arrested again on a marijuana charge. Police found a pound of marijuana in the car he was riding in. According to the Springfield News-Leader, Green-Beckham was originally arrested for possession of a controlled substance with intent to distribute following a traffic stop but was later released without charges, pending further investigation. Later evidence indicated the marijuana belonged to another passenger in the car. On Friday, April 11, 2014, Dorial Green-Beckham was dismissed from the University of Missouri football team, following his prior drug-related problems and an incident in which he allegedly forced open an apartment door and pushed a woman down a flight of stairs. Green-Beckham was not charged in the last incident. Head coach Gary Pinkel said in a prepared statement, "This decision was made with the best interests of all involved in mind. Dorial's priority going forward needs to be focusing on getting the help he needs. As we have all along, we will continue to do everything we can to assist Dorial and his family. We care deeply about Dorial and his well-being, but hopefully he can benefit from a fresh start." 1 2 3 Stephen Spiewak (2010-07-15). "Becoming Dorial Green-Beckham - MaxPreps News". Maxpreps.com. Retrieved 2012-02-06. ↑ Adam GorneyRecruiting Analyst. "Junior of the Year: Green-Beckham". Footballrecruiting.rivals.com. Retrieved 2012-02-06. ↑ Parker, Brandon. "Green-Beckham breaks national career receiving yards record". Espn.go.com. Retrieved 2012-02-06. ↑ "Dorial Green-Beckham sets record". Espn.go.com. 2011-10-28. Retrieved 2012-02-06. ↑ Brian McLaughlin. "Sporting News High School Athlete of the Year: Dorial Green-Beckham". Aol.sportingnews.com. Retrieved 2012-02-06. ↑ "Rivals.com". Rivals.yahoo.com. Retrieved 2012-02-06. ↑ "Scout.com College Football Team Recruiting Prospects". Arkansas.scout.com. Retrieved 2012-02-06. 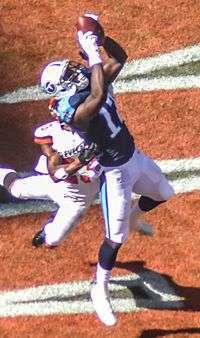 ↑ Dorial Green-Beckham (2011-08-25). "ESPN.com recruiting". Espn.go.com. Retrieved 2012-02-06. ↑ Brian McLaughlin. "Sporting News' Top 125: No. 3 recruit Dorial Green-Beckham to cut list to 5". Aol.sportingnews.com. Retrieved 2012-02-06. ↑ "Hillcrest High School's Dorial Green-Beckham earns co-MVP award in U.S. Army All-American Bowl". kspr.com. 2012-01-07. Retrieved 2012-02-06. 1 2 "Location leads Green-Beckham to Mizzou". Rivals.com website. 2012-02-01. Retrieved 2012-02-01. 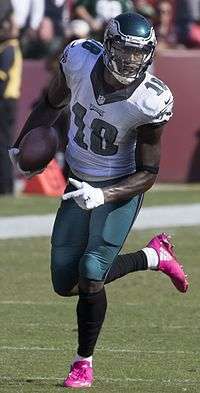 ↑ "Dorial Green-Beckham offers blueprint on how to handle recruiting". ESPN. February 7, 2012. ↑ "DGB-led freshman class makes impression". Kansas City Star. July 18, 2012. ↑ "Marcus Murphy's punt return sets up Mizzou's grind-it-out win over UCF". ESPN.com. September 29, 2012. ↑ "Missouri rallies after half, stuns Tennessee in 4 OTs". ESPN.com. November 10, 2012. ↑ "NCAA denies Oklahoma's waiver for Dorial Green-Beckham". CBS Sports. August 22, 2014. ↑ Teresa M. Walker (May 1, 2015). "Titans Select WR Dorial Green-Beckham in Second Round". AP Pro Football Writer. Retrieved May 1, 2015. ↑ sportrac.com. "Tennessee Titans/Dorial Green-Beckham contract". Retrieved December 25, 2015. ↑ Tim Daniels. "Kendall Wright injury=Updates on the Titan's WR knee and his return". Retrieved December 25, 2015. ↑ NFL.com. "NFL.com Player Profile:Dorial Green-Beckham". Retrieved December 25, 2015. ↑ "Eagles acquire Dorial Green-Beckham from Titans". Retrieved 2016-08-16. ↑ McLaughlin, Brian (January 15, 2012). "The Chance to be Great". The Philadelphia Inquirer. Parade. p. 9. ↑ Smith, Christopher. "DGB's little brother eschews Mizzou football for modeling career". saturdaydownsouth.com. Saturday Down South. Retrieved 3 May 2015. ↑ "MU's Green-Beckham, 2 others suspended after drug arrest". KCTV-TV via website. 4 October 2012. Retrieved 4 October 2012. ↑ "Missouri wide receiver Dorial Green-Beckham settles pot charge". Associated Press via KTVO-TV. 15 November 2012. Retrieved 15 November 2012. 1 2 "Missouri star Dorial Green-Beckham's arrest tied to drugs". Associated Press via USA Today online. 11 January 2014. Retrieved 11 January 2014. ↑ "Missouri WR Dorial Green-Beckham arrested on drug charges". Yahoo Sports website. 11 January 2014. Retrieved 11 January 2014. ↑ "Mizzou cuts Dorial Green-Beckham". ESPN Sports website. 11 April 2014. Retrieved 11 April 2014.